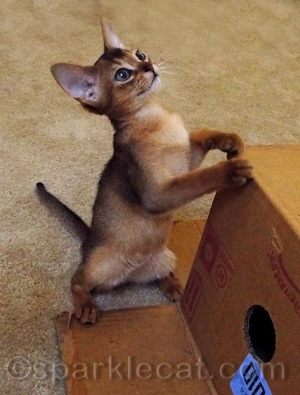 I got an email the other day from a family who is getting an Abyssinian kitten — and they have never had a pet before! So I am going to do something different with this advice column: I am going to give my suggestions, and then I want you to comment below and offer yours! I know I have readers with loads of kitten experience, and I would love to have you offer your wisdom to this nice human and her kids. We get to bring our Aby home in the middle of May! We named her Pixel. (We are geeky computer humans.) We brought her a fuzzy mouse, a crinkle pompom and freeze dried chicken. Here’s the thing: I am a 41 year old mother of two. My kids (aged 6 and 9) are healthy and happy. We love to play. Even so, I have never had a pet. Weird, yes. As someone who has never been owned by a pet of any kind, I am feeling a little lost as to how to prepare to care for a living thing with more legs than I have. After an incredible amount of research we decided that an Aby would be smart enough to train us somewhat. 🙂 Do you have any advice as to what to have in the house on arrival day and how to handle the first weeks? She will be almost 4 months old when we bring her home. From a cat carrier to litter selection, I am lost. Help? You are in for a lot of fun! Kittens are always an adventure, and Abys doubly so because they are so active and bright. To prepare your home for your new kitty, you need to think of two things: 1) how to create an awesome kitty playground, and 2) how to kitten-proof your home to keep her from getting into anything that would be bad or dangerous for her. Since #2 is crucial for her safety, I will address that first. A four-month-old kitten is like a human toddler in curiosity, intelligence and propensity to get into everything! Abys especially because they tend to use their paws like monkey hands. So you should consider kitten-proofing any cabinets containing cleaning materials or anything that would be dangerous for cats, and making sure all your trash cans have lids. Some things are dangerous for kitties that you might not expect, such as dental floss, rubber bands and ribbons — if swallowed, these could harm your kitten and possibly endanger her life. My human always thinks keeping the lid down on the toilets is a good idea so kitties don’t fall in. If you have flowers or plants around the house, be careful because cats often will chew on them, and many of them are deadly poisonous to kitties. Lilies for example, will kill a kitty very quickly. 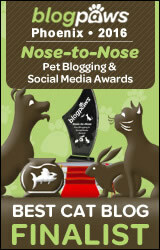 This list from the ASPCA is helpful. And here is a great PDF file from PetCo about common household dangers to watch out for. As for things like litter, carrier, types of food, etc., the best thing to do is ask the breeder what she is using or suggests. When bringing a new kitten home, it’s best to keep the same brands of litter and food she is used to. Ultimately, an all moist food (i.e., no kibble) diet is best, preferably grain-free or perhaps raw, but start with what the breeder is feeding. The litter pan should be open, without a lid. Why? Imagine having to use an outhouse as your bathroom for your whole life — that is what a covered litter box is like for a cat! Leave her litter box open and scoop daily. For a carrier, get something made out of hard plastic that has openings on the top and in the side, so you have different ways to get her in it. Ask your breeder how large a carrier you should get — she knows about how big your kitten will be as an adult. Now for the fun part — making your home a kitty playground! Kittens are hyperactive, have ADD and get bored easily. You need fun climbing surfaces — a cat tree in front of a window is always a good idea, especially if the window has lots of birds and other critters running around. If you have the budget, I’d say get more than one tree for different rooms. Your Aby kitten will likely use these as a jungle gym. Little mice, balls and crinkly toys are fun, and some kittens even learn to fetch. Also get some interactive toys — feathers on wands or mice or feathers on strings attached to sticks (like Da Bird). Playing with your Aby is fun for both of you and helps create a human-kitty bond. You should play with her every day, even after she is an adult. We are all over 10 years old here, and we are still maniacs about playing! One note — the stick and wand toys should be put away when you are not using them. Kitties might chew and eat the strings and make themselves sick. Make sure you have a variety of scratching surfaces. They can be cardboard, sisal or carpet, and you should have both vertical and horizontally-oriented scratchers, because scratching is not just for claws — it is also a way for your kitten to stretch and exercise her limbs. The first few days when you bring your kitten home, you will want to confine her to one room to have her get acclimated. Being free in a whole, big house or apartment might be overwhelming, so introduce her to the rest of the house gradually. Let her call the shots, but keep an eye on her. She will find hiding spots that will frustrate you when you go look for her! So as soon as possible, get her to know her name and come when called. If you reward her with treats or play when you say her name, she will learn. Never punish a kitten by screaming at her, handling her roughly or even squirting her with a water bottle — it only teaches her to fear human contact, and to save her misbehavior for when you are not around. The best thing to do is distract her with something more interesting if you catch her in the act, or close off the area where she is making trouble and figure out things that are more fun for her to do. If she is constantly getting in trouble, it could mean she is bored and you are not playing with her enough. Play with her until she is exhausted! Vigorous play is good for a kitten. There are books you may want to get, because living with a kitten — especially when you have never had a pet before — is a big topic that needs more than I can give you in one blog post. I have a list of great kitten books, written by respected experts — I recommend any and all of them. That’s what I’ve got for you, but I really hope my readers have more tips to add! Because you can never have enough knowledge when you are adopting a kitten! More advice, anyone? We also got Karen Pryor’s “Getting Started Clicker Training” kit and an older book, J. Anne Helgren “Abyssinian Cats.” I’ll check out the books you’ve recommended too, Sparkle! My 9 year old has also been spending a fair amount of time on the lolcats site, haha. She feels that this is a fabulous intro to funny cat situations and is prepping my phone for video space. I’ll send pictures when we pick her up. As of now it’s May 16th. But I’ve asked if there’s any wiggle room there as we are just *so* ready! This is so exciting! They are going to have so much fun! Kittens are wonderful. 1) I always recommend a scratching post/tree that is *at least* as tall as your hip. The taller the better. Climbing is an important part of your kitty’s health. Getting up off the floor to survey the territory is good for their mental health. 1. Two litterboxes (one of us – no names- prefers to do #1 and #2 in different ones). 2. A variety of toys until you learn which she prefers (and there is always a preference). Fer example, fer personal play, one of us ONLY wants rattley mouses, another only likes plastic milk rings, and the other really only wants tossed kibbles. But all 3 of us like wand toys when the Bein moves them around good. 3. Some breeders teach the kittens to use the human litterbox. Two of us were trained that way, but since the other cats in the house used regular litter boxes, we preferred those. So if yer new kitty is trained that way, keep it that way. 4. Pay attention to the accustomed foods, but if they aren’t the healthiest ones, go to a good pet store and buy a couple cans each of many other healthy kinds. Keep a chart of the ones the new kitty likes. Mixing the old with the new can help. Getting yer kitty on the healthiest foods is a lifelong gift (and a gift of long life). 5. DO NOT watch those TV shows about training cats. Those Beins teach dominance! You don’t want to dominate yer new companion. You want to form a friendship, and friendship is a mutual learning experience. 6. We like to climb. If you give us our own stuff to climb, we will use them. If not, we will climb stuff you would rather we didn’t. Cat trees can seem odd to Beins, but after a month, they get used to them as “furniture”. 7. The same goes with scratching. We WILL scratch on stuff (we HAVE to). So get us an ESS and a couple of those cardboard scratchers (that sit on the floor). Oh, and make sure the cat tree has lots of sisal rope around the posts. See above about scratching. 8. Lastly, we might add that MOST kitties are happier with another kittie around… That doesn’t mean less interaction with the Beins, but its good to lick another friend and curl up fer warm naps, and do pounces, and stuff like that. Great advice. I’d add to make sure the children know how to treat a living cat and don’t think it’s a doll and start dressing it up or putting makeup on it. Also no paper cups attached the the cat’s feet with rubber bands. Make sure they always pick the kitten up properly, supporting its entire body. No matter what, DON’T GET THE KITTEN DECLAWED no matter what your well meaning friends may tell you. It’s amputation and very cruel. Such great advice and comments that I really have nothing to add. Oh, except another vote for child-proof locks on cabinets. Believe it or not, my mom has these on strategic bath and kitchen cabinets for US–and we’re all over 5! Max says large paper bags are his favourite thing to play in, but remember to cut the handles off for safety. Myrrh says her brush is her favourite thing and loves being brushed every day. Great as usual Sparkle. I would worry about the kids…never mind. I’d suggest having some cat grass for Pixel (great name!) to nom. I’m owned by two cats and the cat grass I have for them does a great job of keeping them from chewing on the other plants I have. Oh the joy of having an Aby kitten!!!!!! Very nice Sparkle. And of course, they won’t be prepared for just how active this little abby will be–no one ever is even when they’ve had them, I think! Enjoy and realize they’ll calm down in about two years. Or four…Jake’s STILL settling down! I love the name Pixel! May I suggest shoeboxes? We kitties love shoeboxes. – Crepes. Do not declaw for any reason. Make sure there are lots of scratching post around, use catnip or something else similar to attract the kitten. Be proactive about protecting this way you won’t get angry about when he/she does it. That is some great advice Sparkle. The only other thing I can suggest is that they set the kitten up in a certain room so it kind of has a safe place to call home and let it get used to the kids and all of the life going on there. And maybe shut it up in the room when kids are running in and out of the house to keep the kitty from escaping. Just my thoughts. We sure wish them all the luck with the new kitten. OMG Sparkle…pleasepleaseplease refer them to my blog, too! I can give them so much assistance on life with Abys…links, support groups…you name it. Send them my email if you wish and I’ll advise them directly. 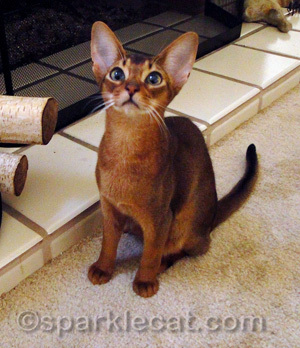 Also, they should join the Abyssinian Cat Club on Facebook. There’s over 2,000 members worldwide and it’s an awesome resource for humans who live with Abys. I can help them with leash training and travelling, too. Those photos are breathtakingly cute (literally) – is that their actual kitten?? They are actually photos of kittens my human took for a Cat Fancy story she wrote a couple of years ago. She said it was like photographing a barrel of monkeys – and at least as much fun! That first one, by the fireplace, SO reminds me of Jake. The only thing WE can add is: INDOOR ONLY!!! The MYTH that “cats are happier outside” is bogus! And I speak from experience – I’m WAY happier being an indoor only kitty. And of course, anyone with a brain wouldn’t allow any cat, much LESS a beautiful Aby, outside (unless properly body-harnessed & supervised at all – and I mean ALL – times!) … but seriously, there are too many dangers and ugly things outside. 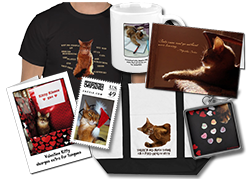 A cat is happiest – and a kitten DEFINITELY is happiest – where he or she is safe, 100% safe. And loved. As I’m sure this little kitten will be. MomKatt is envious of these people. Having been owned by a ruddy Aby (2 of them) and one blue Aby, she says it’s the best captivity (besides MINE of course of her) that she’s ever experienced & one day, she’ll have another ruddy boy. These folks are SO lucky to be getting an Aby! That kitten is so very cute. It looks a bit like you Sparkle. I do not know about kittens – if it were a kid I could offer all kinds of advice as I know goats! Excellent advice, Sparkle! You mentioned kitten-proofing the cabinets–I would recommend putting child-proof locks on them as well. My first Somali used to try to drag all the pots and pans out of them. Fortunately, before he decided to hit the china in the cabinets, I put locks on them. I did not want him jumping down on broken glass and china! Also, it is not a good idea to store food and treats in glass or china containers on a counter or a shelf anywhere in your home–one of my cats pushed just such a container off the counter (he had to really work at it because it was big and heavy and was more than 2′ from the edge) and it shattered all over the floor. I was not at home at the time and I thank God that none of my cats was injured by ingesting the ill-gotten goods that were covered in shards of pottery. Also, if you bake–never leave rising dough anywhere that the cat may be able to find it and eat it–it can expand in his/her body and kill the kitty. I took a bread baking class and the instructor warned us about this. One more thing, too. When unpacking your groceries, put everything away immediately. I have had several cats rip into items in which you would think they would have no interest. If you don’t want them to eat something no matter what it may be–put it somewhere inaccessible. Hope this helps! I’d endorse the advice from all above as great. All I can add is just relax, spend time with your new kitten and trust your intuition, after all you’ve raised two kids so you’ve had some good practice! Get to know the kitten’s personality and let him get to know you. You’ll make mistakes and so will the kitten, thats what memories are made of. I envy your new journey and relationship with Pixel. My new kitten was what made me start a blog and he is now three and a half and a joy every day. We think tunnels to hide in and ambush feet from are great fun and also we love springs to whap about although they might be best after the “chewing on everything phase” in case they get bitten through ( NB. Lucy plays with her springs for ages every day and has never bitten through her springs yet). Don’t forget to take lots of pictures because it is amazing how quickly they grow. As always, your advice is impeccable, Sparkle! Of course, you can draw from your own experience. By the way, I have never used Photoshop. I use something which is much simpler called “Photoscape”. I doubt it has all of the PURRmutations of Photoshop, but I have fun with it anyway. AWWW !!! Mini Sparkle…so cute !!! Me and Mom got no idea with da kitten, we are sorry cause when I first come to mom I was already 2and a half. Excellent advice, as usual, Sparkle. They have a great cattitude! Very good suggestions, Sparkle as always. I would also add, that even if your kitty is never going to go outside, it is a good idea to get her microchipped, because even the best kitty households can’t watch her all the time and she could get out and go for a wander! And since we experienced the trauma of the fire secondhand while watching Sebastian go through it, we know that sometimes disaster can strike and an indoor kitty can find himself outside in scary territory very unexpectedly. Just another reason for that microchip! And many microchip companies offer ways for you to store medical records on your new kitty too.